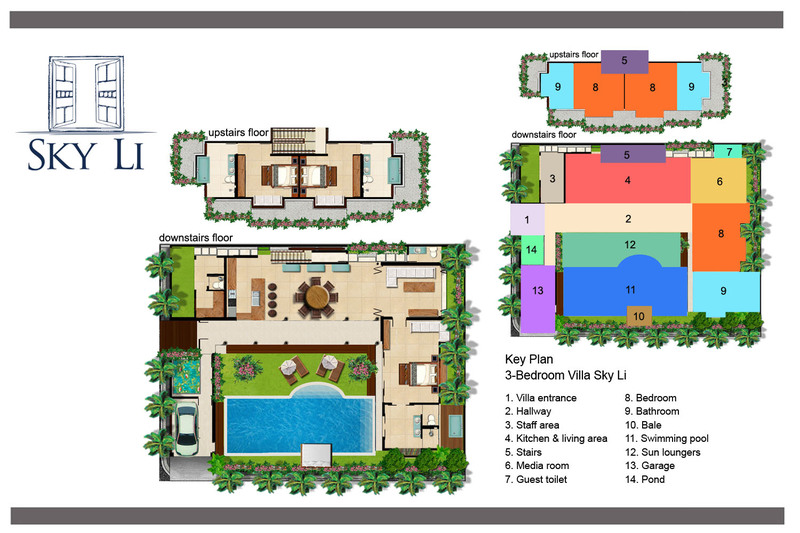 Villa Sky Li is centrally located in the heart of the famous and cosmopolitan Seminyak area. Close to tasteful restaurants, trend shops and glittering nightlife, the villa is also perfectly located at only five minutes walking far from the beach. Villa Sky Li is two levels villa can welcome up to 6 persons thanks to its three bedrooms. The villa is layout around a 12 meters swimming pool and a lovely garden and all spaces of the ground floor give on it by large sliding glass doors. On the poolside you can relax on the two sun chair or the cushioned bale after hard day of shopping. The owner of Villa Sky Li put a special attention on the decoration of this stylish and modern villa to make you feel right at home. All the villa is decorated with wood furniture, incredible art pieces and lighting vibrant colours. The opened dining space has a fully equipped kitchen located behind an American bar, where you can have your morning coffee, or just enjoy a drink with your friends. The 6 people dining table is located near a comfortable L-shaped sofa. All the living and dining area has air conditioning, Bose surround-sound system, iPod dock, Large TV with satellite and DVD. On the ground floor you will find also the spacious master bedroom. This tastefully decorated bedroom is furnished with a king-size four-poster bed from where you can watch TV on a 42-inch screen or look over the green and tropical garden. The bedroom has its own en-suite bathroom for more intimacy, fitted with a bathtub and rain shower. The two other air-conditioned bedrooms are located on the upper-floor, accessible by a recycled ironwood staircase. The bedrooms have en-suite bathroom with bathtub and shower. One of them has king-size bed while the other is furnished with twin beds (convertible to one king-size bed). at Villa Sky Li, all rooms have TV, DVD player, iPod dock and safe-deposit box in order you take the most of your stay. Our staff will also be there to provide you best quality services and they will be always ready to respond to any of your desire, to ensure your stay the best memorable. This tastefully decorated bedroom is furnished with a king-size four-poster bed from where you can watch TV on a 42-inch screen or look over the green and tropical garden. The bedroom has its own en-suite bathroom for more intimacy, fitted with a bathtub and rain shower. 6 people (2 bedrooms with king-size beds; 1 with twin beds convertible to a king). Up to 2 extra beds available on request charged at US$50++ per night for adults, and US$35++ per night for children. The price includes breakfast. Open-plan kitchen, breakfast bar and dining room; TV lounge; poolside bale..
Villa manager; chef; butler/waitress; housekeeper; gardener. Additional staff (babysitters, masseuses, spa therapists) available on request (extra charge applies). Satellite TV; DVD players; Bose surround-sound system; iPod docks. Villa Sky Li is well equipped for families. Facilities include: baby cot; high chair; DVDs and games. Airport transfer is available to and from the villa. The villa’s central Seminyak location means that many attractions are within easy walking distance. If additional transport is required, the villa manager can call one of the island’s safe and reasonably priced metered taxis, or organise car and driver hire (additional cost). Back up generator; safety deposit boxes. Airport transfer included minimum 5-night stay by PURI ASIA. *Rate is subject to 15 percent tax and service charge. Please note the above rates are valid until 31 Mar 2020. Kindly email us if you would like to make a booking after this date.